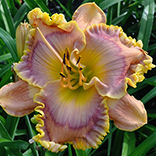 ACROSS THE GALAXY (D. Trimmer) Tetraploid (Isle Of Man x Across The Universe) 32” M. Re. Ev. 6 1/4” ACROSS THE GALAXY is my much improved version of its pollen parent, ACROSS THE UNIVERSE. Taller, better branched, rounder and a much easier pod parent, I’ve used ACROSS THE GALAXY a great deal in my breeding the past two years. 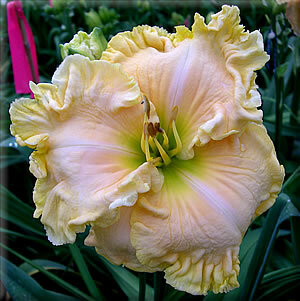 The well branched scapes display extremely ruffled, circular, flat ivory peach blooms just above the vigorous foliage. From first blooms to the last, with the flower size remaining the same, the beautiful display is very consistent with rebloom into the fall even here in Florida. The picture says it all.